Pearce Henry Crouch used his middle name professionally, and so will be referred to by that name throughout this essay. His father’s name was also Henry, which has caused confusion to some historians, who have occasionally attributed the Crouch optical business to the father. But the father managed an iron works and died in 1882, whereas every aspect of Pearce Henry Crouch’s life is consistent with him being the microscope maker. Henry Crouch learned his trade as an apprentice with Smith, Beck & Beck. The 1861 census records that the 22 year-old was still in that position. Henry left his masters and formed his own company, probably in early 1862. His younger brother, William, joined him. William does not appear to have been trained as an optical worker – the 1861 census listed him as being a “civil engineer”. The original H. and W. Crouch shop was located on Regent’s Canal Dock, Commercial Road, London, and their earliest instruments bear that address (Figure 1). The Crouch brothers initially produced copies of the microscopes that Henry had made for Smith, Beck & Beck (Figure 1). They evidently realized that there was a limited market for knock-off mimics of high-end microscopes. The partners soon focused on producing good-quality, less-expensive microscopes for the middle-class microscopist and student. 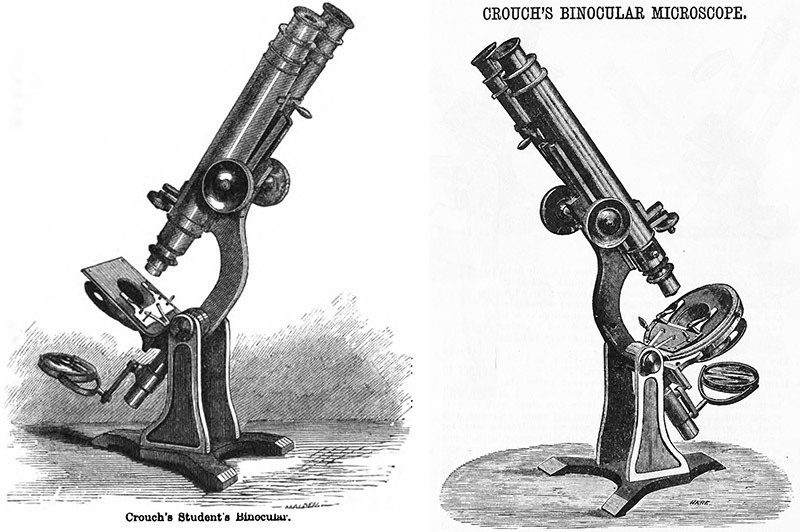 In particular, Crouch brought out a greatly-admired binocular microscope (Figures 2 and 3). Washington Teasdale later wrote that “in 1862 … there was … a demand for a cheap binocular, and, in meeting this, Messrs. H. and W. Crouch were pre-eminently successful, and the position gained by them has been ably sustained to this day. I was so fortunate as to get one almost at the first, and have seen few binoculars to equal, and none to surpass it. I have not, of course, Zentmayer’s glass rotating stage, and the other improvements Mr. Crouch now supplies; but otherwise it is as perfect as a binocular could be”. 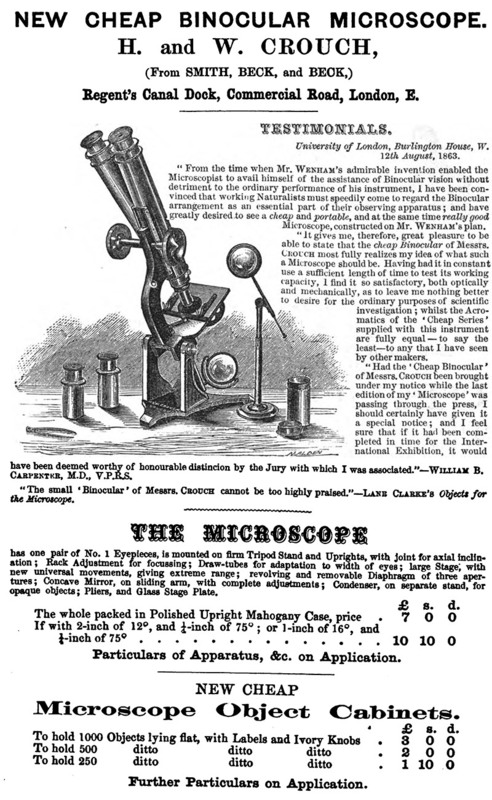 Advertisements for the Crouches low-priced binocular microscopes include testimonials from celebrity microscopists such as William B. Carpenter and Louisa Lane Clark (Figure 3). Clark’s testimonial was dated November, 1862, consistent with Teasdale’s later recollection. She included a description and picture of a later version of Crouch’s binocular in her classic book, Objects for the Microscope. The Intellectual Observer published a review of the Crouch binocular in April, 1863, “Messrs. H. and W. Crouch have introduced a new binocular microscope to meet the demand for an instrument of moderate price and sufficient excellence for ordinary purposes. The novelty consists in a moveable stage, intended, like the excellent one devised by Mr. Pillischer, to act as a substitute for the superior, but necessarily expensive, screw movements. The object-carrier, furnished with two spring clips, is attached to a sort of chain composed of three flat links joined to each other by screws, so as to produce a moderate stiffness of motion. The lowest link is screwed to the stage a little out of the centre. If the object-holder is pushed upwards, the links are straightened, while, if it is pushed downwards, they are bent into elbow-joint angles, and lateral motion is easily effected. A few minutes’ practice will enable any one to work this arrangement so as to be useful with a low power, or with a quarter. The prism of this instrument performs well, as do the cheap series of glasses with moderate angles of aperture. We tried a number of objects with the two-inch and one-inch powers, and can state that few students will desire a greater perfection or refinement of performance. Messrs. Crouch undertake to supply objectives of high quality for those who wish them, but we congratulate them, and other successful makers of cheap instruments, on the good they are accomplishing, as it is by such means only that the taste for microscopic studies can be extended, and students trained so as to be able to employ with advantage the exquisitely perfect instruments and glasses that our best makers can produce”. Henry joined the Royal Microscopical Society in 1863, and the Quekett Microscopical Club in 1866. William does not appear to have become a member of those or any other microscopical society. Henry and William exhibited twelve microscopes at the 1863 Annual Soiree of the RMS. This suggests that they may have been making several different models by that time. Advertisements as early as September, 1864, indicated a move to 64A Bishopsgate Street (Figures 4 and 5). For several years afterwards, the Crouches retained the Regent’s Canal Docks location as their factory, although not as a retail location. Of known microscopes, number 151 is engraved with the Regent’s Canal Docks address, and 207 has the Bishopsgate Street address. Henry and William exhibited instruments and accessories at the 1866 Dublin Exhibition, winning a Prize Medal for “excellence of microscope stands and objectives”, and an Honourable Mention for “cabinets”. They also exhibited “microscopes, object-glasses, &c.” at the 1867 Paris Universal Exhibition. The Crouch brothers dissolved their partnership on February 27, 1866, with Henry retaining the optical business. William Crouch married Sarah Dalman on December 15, 1866 (Henry had married earlier, to Elizabeth Halbert, in 1863). The 1871 census described William as a “clerk & traveller” (presumably, a salesman), living in Stepney, London. In 1879, he advertised that he was a “first-class photo. colourist and negative retoucher”, working from 9 Blandford Street, Portman Square, London. I did not find any further information on William in that line of work. The 1891 census recorded him as being an “agent”, living in Finchley, London. The 1901 census described him as an “engineer mechanical construction” who worked for another entity, and lived at 2 Park Lodge Villas, Finchley. His 1906 voter registration has the same address, and his 1910 registration has him living in Hornsey. I have not located any information on William Crouch from after 1910. Figure 1. Microscope number 67 by Henry and William Crouch, ca. 1862. It is engraved with their original address, Regent’s Canal Dock, London (upper right panel). It is a copy of the Smith, Beck & Beck “Large Best” microscope, which Henry Crouch would have made as an apprentice. 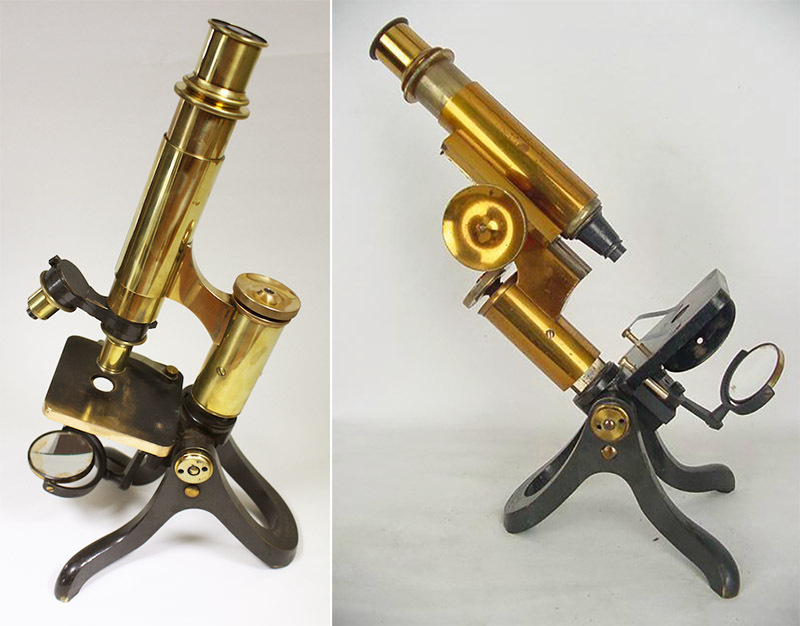 The Crouches continued to make this model for several more years – serial number 306 is very similar (in the Alan Wissner collection, http://www.antique-microscopes.com/photos/large_Crouch.htm). 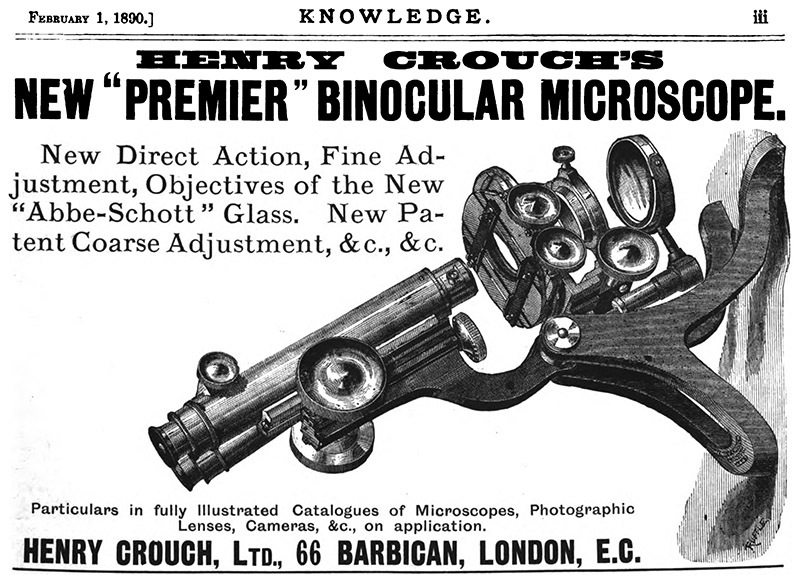 Soon, however, the Crouch product line became dominated by less expensive binocular microscopes, of a more distinctive design (Figures 2-4). Figure 2. Binocular microscope with serial number 151, signed "H and W Crouch, Regent’s Canal Dock London". The address dates this microscope to between the firm’s founding in 1862 and their 1864 move to Bishopsgate Street. Figure 3. 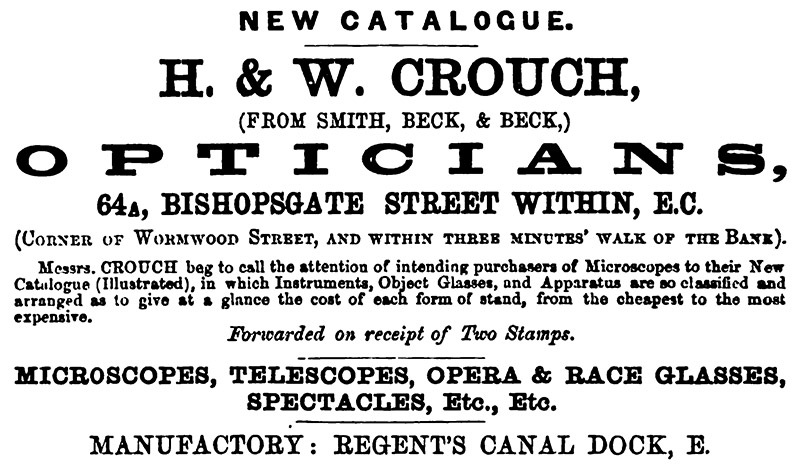 A July, 1864 advertisement for H. and W. Crouch’s inexpensive binocular microscope. Figure 4. Advertisement from “The Intellectual Observer”, November, 1864. Note the new address of 64A Bishopsgate Street, and retention of the Regent’s Canal Dock location as a factory. Instruments bearing the Bishopsgate Street address date from mid-1864 until ca. 1868, when Crouch moved to 54 London Wall (Figure 6). Figure 5. 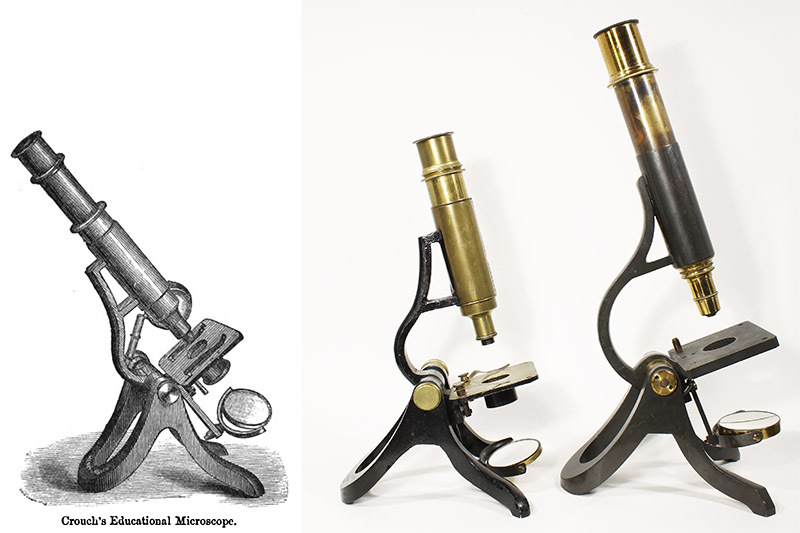 Microscopes number 207 (left) and 228 (right three images), from H. and W. Crouch, produced after mid-1864. Both are engraved with their address of 64A Bishopsgate Street, London, to which the Crouches moved in the autumn of 1864. Examination of surviving instruments indicate that the Crouches simultaneously produced microscopes with tripod feet positioned in either orientation - opening either to the front or the back. Figure 6. By 1868, Henry Crouch was working alone, and had moved to 54 London Wall. Advertisement from “The Popular Science Review”. Figure 7. A. Detail of binocular microscope number 336, signed “H. Crouch, 54 London Wall”, produced in either 1866 or 1867. Serial number 313 is signed “H. and W. Crouch, 54A Bishopsgate Street”, indicating production before Henry and William parted ways in early 1866. B. The Henry Crouch binocular microscope with serial number 361 bears an inscription that it was given as a prize in 1867, providing a firm date to this number. Figure 8. Henry Crouch moved to 66 Barbican in mid-January, 1873. This advertisement appeared in the January 17 issue of “English Mechanic”. The previous week’s advertisement did not mention the move. The causes for the split between Henry and William are not known, although Henry’s training as an optical manufacturer and William’s as a civil engineer may have led them in different directions. Nonetheless, Henry Crouch’s business flourished. The 1871 census recorded Henry, wife Elizabeth, and their three young children as living at 27 Albert Square, Stepney. That they did not live above Crouch’s shop indicates a substantial income that could support both a business and a separate home. His business then employed “8 men and 3 boys”. The business moved again in early 1873, from London Wall to 66 Barbican (Figure 8). By this time, Henry was selling his instruments on both sides of the Atlantic. The 1870 catalogue from James Queen, of Philadelphia, USA, included microscopes from Crouch along with apparatus from Nachet, Hartnack, and Zentmayer. Queen was also listed as Crouch’s US retailer in 1881. Henry Crouch visited the 1876 USA Centennial Exhibition in Philadelphia, displaying his products and meeting with the American scientific community. His presence probably helped influence the overall positive reviews of his work, such as these comments on the Microscopical Conversazione that appeared in The American Journal of Microscopy and Popular Science, “There was a very large display of microscopes - considerably over one hundred - representing the work of all the best known makers. Quite a large number by the Becks, of London, varying from the cheapest to the best; one or two by Powell & Lealand, and several by Crouch and Zentmayer. Crouch was represented by a remarkably fine No. 2 stand of exquisite workmanship. This stand attracted a great deal of attention as being a really first-class instrument at a moderate price. In addition to this several of his smaller stands were present in the hands of their owners. … The so-called circulation of the sap in plants was very beautifully shown under several instruments, but by none more effectually than by Mr. Crouch under his large instrument with dark ground illumination produced by the parabaloid. Our American makers have neglected too much these special methods of illumination, and have depended altogether upon the mere quality of their objectives. Not that the latter should be ignored, or any less degree of importance attached to it than has been done, but at the same time the other should not be left undone. Our English cousins, by means of their special and not very expensive devices, obtain results that we find it difficult, or, rather, impossible to equal. One reason why Crouch’s instrument’s are such general favorites is that special attention has been paid to these too often neglected points”. Upon his return, Crouch gave a presentation to the Quekett Microscopical Club on his impressions of microscopy in the USA. Some excerpts: “With respect to those exhibited by English manufacturers, it will not be necessary for me to describe instruments so well known to you as those manufactured by Messrs. Beck, Dallmeyer, Ross, and myself, comprising the English exhibitors. It will be sufficient to observe that Messrs. Ross and Co. exhibited some twenty, Messrs. Beck about twelve, Messrs Dallmeyer two, and myself sixteen; including, with one exception, every form of stand manufactured in this country, and together being more than twice the number exhibited by all other countries included. The American makers represented were Messrs. Zentmayer, J.W. Queen and Co., the Bausch and Lomb Optical Co. (with whom is associated Mr. Gundlach), and Mr. Wm. Wales, who exhibited a few objectives only. Messrs. Zentmayer exhibited some nine microscopes, Messrs. Queen and Co about six, and the Bausch and Lomb Optical Co. three or four, the latter having but just commenced the manufacture of this instrument. Amongst the French exhibitors were Messrs. Nachet and Sons, who exhibited some five or six instruments. 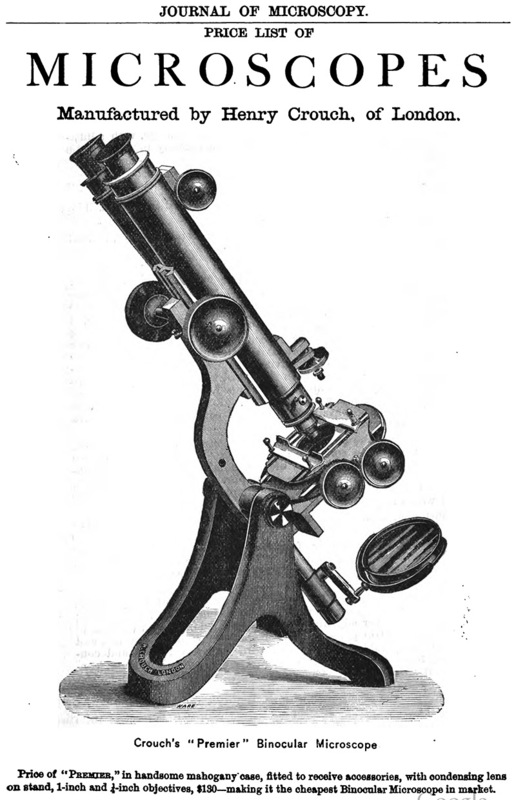 Those remaining need scarcely be specified individually, the microscopes shown being of that inferior class usually supplied to their unfortunate victims by those whom I may, perhaps, be permitted to term ‘Shopticians’, and which, I am afraid, more often create a prejudice against, than a taste for, the prosecution of microscopic investigation. The only microscopes of German manufacture that came under my notice were those shown by Ploessel, who exhibited a few on the ordinary Continental model. … I had the pleasure of receiving many valuable hints respecting the improvement and modification of some of the accessories from Dr. Woodward of Washington, Dr. J.G. Hunt and Mr. Holman of Philadelphia, Dr. Ward of Troy, and other microscopists, which, when I have had an opportunity of carrying out, I hope to submit to your further notice. … Mr. Walmsley, of the firm of J.W. Queen and Co.; Dr. Beattie, of Baltimore, and Mr. Edmund Wheeler, of London, were, I believe, the only exhibitors of prepared specimens for the microscope. The latter gentleman exhibited an excellent series, including some very fine transparent injections. Mr. Walmsley and Dr. Beattie both submitted some very excellent specimens of the double staining of vegetable tissues, a subject to which considerable attention has been devoted in the United States. I have the pleasure of submitting to your notice some very beautiful preparations of this description, mounted, and kindly presented to me by Dr. Hunt, of Philadelphia, which will be found to illustrate vegetable structure in a remarkable manner. As examples of mounting they are unsurpassed. … Micro-photography, no doubt owing to the influence exerted by the example of Dr. Woodward, is much more extensively employed than at home, and there can be but little doubt has had considerable influence upon the construction of American objectives, especially in the increase of the angle of aperture of the higher powers. … From the fact of my visit taking place in the summer and autumn seasons, during the greater part of which time the societies generally are not in session, I had but few opportunities of attending meetings, but I had the pleasure of meeting in course of my stay a large number of the working microscopists from all parts of the Union, and I must say I was surprised to find so thorough an acquaintance with all that is passing amongst us. I also wish to take this opportunity of tendering my hearty thanks for the boundless hospitality displayed, and the anxiety shown to render everything as agreeable as possible, in whatever direction one might happen to travel. … should any microscopist desire to enjoy an especially good time, I should strongly recommend him to spend his vacation, if possible, in the United States”. Presumably a result of connections made during his trip to the US, Henry Crouch filed for a patent in 1877: “to Pearce Henry Crouch, of the city of London, for the invention of ‘improvements in microscopes’ – a communication to him from abroad by Ernst Gundlach, of Rochester, New York, United States of America”. Business continued to improve for Henry. The 1881 census recorded that he employed 20 men and 6 boys. He had also moved his home again, to what one hopes was a rather large house in Grove Hill, Church End, Woodford, Essex. His wife, Elizabeth had died shortly before, but the household included Henry’s father and mother, his 6 children (ages 3 to 16), his sister and brother-in-law, their two children, and a servant. Henry remarried on March 31, 1885, to Gertrude Emily Donbarand, who was 19 years his junior. About 1886, Henry incorporated as Henry Crouch Limited (Figure 21). Also during 1886, the first known advertisements for Crouch’s cameras and photographic lenses appeared (Figures 21 and 22). A petrological microscope was introduced in 1889. The Journal of the Royal Microscopical Society wrote, “Messrs. Henry Crouch, Limited, have constructed an instrument on the model of that of MM. Nachet, in which the stage and objective rotate together with the upper part of the body-tube, while the eye-piece remains stationary. It is not, therefore, necessary to centre afresh with every change of objective. Among other points is the device for the convenient focusing of the substage condenser when convergent polarized light is employed. The lenses are placed in the tube of the polarizer and are then thrown in and out of the line of light at the same time as the polarizer, by merely moving the bar on which both are mounted. A milled ring above the polarizer focuses the condensers by a single rotating movement, similar to that by which the polarizer itself is rotated. Two analysers are provided, one in the eye-piece and the other in a draw-box above the objective”. Henry’s son, Pearce H.H. Crouch (born in 1870), became involved with the business during the early 1890s. The formality of the father-son arrangement is not clear. Advertisements named the business as “H. Crouch Ltd.”, while a write-up in an 1890 edition of Chemist and Druggist said, “H. Crouch & Son, Barbican, show a new hand-camera, which carries 24 plates in sheaths, which are brought into the focus-plane by a novel arrangement of plunger and lever”. An advertisement that appeared in The Photographic News in 1892 stated that Crouch had opened a second shop, at 141 Oxford Street, in addition to the 66 Barbican location. Possibly overextended, Henry Crouch was forced to auction a substantial amount of goods in 1894. A later letter from Crouch suggests that he was finding it very difficult to compete with Continental manufacturers (see below). The following advertisement was published in The Athenaeum on February 17, 1894, with similar announcements on March 3 and 19: “By order of the Court in a Debenture Holder's Action. First Portion of the Stock of Henry Crouch, Limited. Monday, March 5. Mr. J.C. Stevens will SELL by AUCTION, at his Great Rooms, 38, King-street. Covent-garden, on Monday March 5, at half-past 12 o'clock precisely, the FIRST ROTATION of the STOCK of HENRY CROUCH, Limited, comprising Photographic Apparatus, consisting of Cameras in all sizes - Hand Cameras - Lenses in great variety - Microscopic Apparatus - Dissecting and other Microscopes - Oil Immersion and an Immense Assortment of other Objectives – Telescopes - Thermometers, &c. On view Saturday prior 10 to 4 and morning of Sale, and Cataloging had”. Henry evidently satisfied some of his creditors, then continued to manufacture microscopes and other equipment for several more years. However, he appears to have retailed some or all of his microscopes through the curiously named firms of S. Maw, Son and Thompson, and S. Maw, Son and Sons. (S. Maw took his son, Charles, as partner in 1860, becoming S. Maw and Son. In 1870, they partnered with a Mr. Thompson, to become S. Maw, Son and Thompson. Thompson retired in 1900, and four of Charles’ sons joined, forming S. Maw, Son and Sons). Those names were stamped onto the stages and other parts of Crouch's microscopes (figures 24-25). He wrote a letter to The Saturday Review in 1898, defending English microscope makers. It is reprinted in full, as it conveys insight on popular opinions of microscopes in England at that time, and competition by foreign makers. “Cheap Microscopes. To the Editor of the Saturday Review, London N., 17 September, 1896. Sir, In your issue of last week Mr. H.G. Wells very kindly sets himself the task of showing us English manufacturers of microscopes the extent of our folly, and also the ‘enlargement of our circle of thought’. May I, as one of this small but much contemned body, be gratefully allowed an opportunity of attempting, on the other hand, the enlargement of his ‘circle of view’, and to show as far as possible that, as usual, the Devil is not so black as he is painted. Regretfully, I am compelled, as the result of my thirty-six years’ experience, to traverse nearly every statement made by Mr. Wells. His charge of ‘curious contempt, regal incapacity, autocratic bearing, and love of bouncing overcharge’ leads me to suppose that he has, although possibly unaware of it, mistaken mere shopkeepers for manufacturers - a not uncommon error - or has sampled one of us at the expense of the rest. Again: ‘Seven years ago there was no compound microscope worthy of the name at a less price than five guineas’. I shall be glad to prove to him that this was quite possible to obtain in this country fully fifteen years back, and that a facsimile of the Continental model, for those who prefer it, of London manufacture, and of equal price and quality, has been obtainable for fully half that period. They were even supplied to University laboratories, and are in use and good order to this day. Again, reluctantly I am obliged to controvert the statement that the cheap German microscope ‘kicked the contemporary British £5 5s. instrument out of the market’. As a matter of fact, the latter is in excellent demand at present; and, curiously enough, this much-abused Britisher has reversed the position, and recently expelled his cheap German rival from one of the principal laboratories of the country. The particulars are at the disposal of Mr. Wells. Now permit me to state my view of the case as shortly as possible. Just twenty years ago a German professor - the first theoretical optician of his time - was led to devote his attention to the improvement of optical glass. The result has been an enormous addition to the varieties available and a revolution in the construction of the higher-power microscope objective. In the determination of the practical value of the experimental results he was assisted by a firm of German opticians, then almost unknown here, but who have since secured a well-deserved and world-wide reputation as the reward of their labours, and naturally enough were the first to benefit by the improvements effected, and German microscopes became the fashion. On January 4, 1907 The London Gazette reported the following under “Applications for Debtors’ Discharge”: “Crouch, Pearce Henry (trading as Henry Crouch), 66, Barbican, in the county of London, and residing at Grove Hill, Woodford, Essex, Optician”. That evidently ended Crouch’s debt obligations, and he sold the business in 1907 to S. Maw, Son and Sons. Henry then worked for that firm, supervising manufacture of microscopes and other equipment (Figure 27). Many Crouch microscopes that already existed were additionally stamped with the new owner’s name, and newly-made ones were imprinted on the foot with “S. Maw, Son and Sons” (Figures 24-26). During the early 1900s, Henry Crouch began producing microscopes with horse-shoe shaped, “continental” feet (Figures 28 and 29). The 1911 census recorded Henry as being again widowed. He lived without family, although he did have a housekeeper. The 72 year-old Henry was listed as still being a “worker”. Although Henry Crouch had been an affluent, influential manufacturer of microscopes and other optical instruments, circumstances reversed to the extent that he probably could not afford to retire from work. He died on March 16, 1916. Figure 9. Left, 1868 engraving of “Crouch’s student binocular” microscope, from W.B. Carpenter’s “The Microscope and Its Revelations”, fourth edition. Right, 1870 engraving of “Crouch’s Binocular” microscope from that year’s catalogue from J.W. Queen & Co., Philadelphia, USA. This type of foot remained in use through the construction of microscope number 849. Serial number 942 had a different type of foot (Figure 15). Figure 10. Crouch’s parabolic mirror. Left, engraving from the 1868 edition of Carpenter’s “The Microscope”. Other images of a later version parabolic mirror, as the case is embossed with the 1873+ Barbican address. Figure 11. A higher-end H. Crouch microscope, serial number 478. It is similar to Crouch’s Student Binocular, but has more features, including a complex substage. Figure 12. Henry Crouch’s ca. 1868 “Educational” microscope. Left, from W.B. Carpenter’s “The Microscope and Its Revelations”, fourth edition, 1868. Center, surviving microscope, serial number 436. Right, microscope serial number 568. Figure 13. Henry Crouch experimented with making Continental-styled microscopes, circa 1870. Left, serial number 901. Right, serial number 994. Figure 14. The iconic “Crouch foot” was introduced prior to 1877. This binocular model was featured in a mini-catalog that was included in that year’s ‘American Journal of Microscopy’. Figure 16. Crouch student-type microscopes, with the fine focus encased in a less-than-artistic cover. Right, serial number 2598, with a Crouch foot (also on microscopes ranging from number 1833 to 3312), Left, serial number 2101 with a continental foot (also on number 1577), . Figure 17. Left: an engraving of Crouch’s “Educational” model, from the 1881 edition of W.B. Carpenter’s “The Microscope and It’s Revelations”. 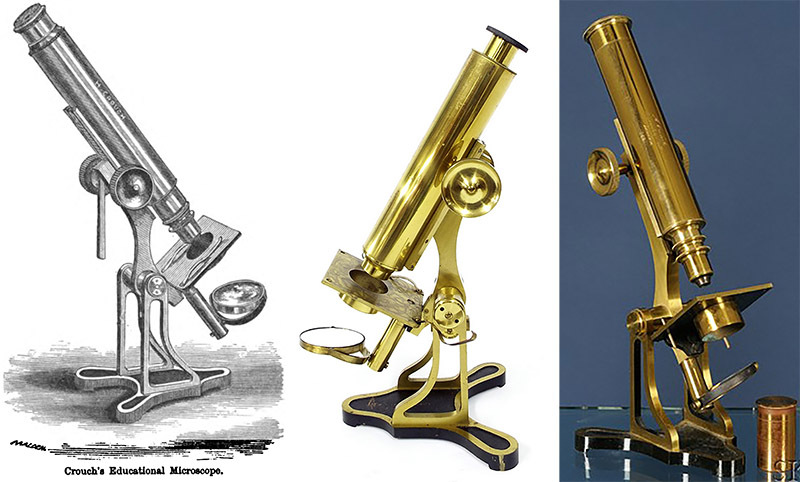 Right, a surviving microscope with serial number 2534, and an unsigned microscope with very similar lines, possibly a later version of the Educational. The foot on the unsigned microscope is slightly different from the one on the left, with angles that resemble the foot of the ca. 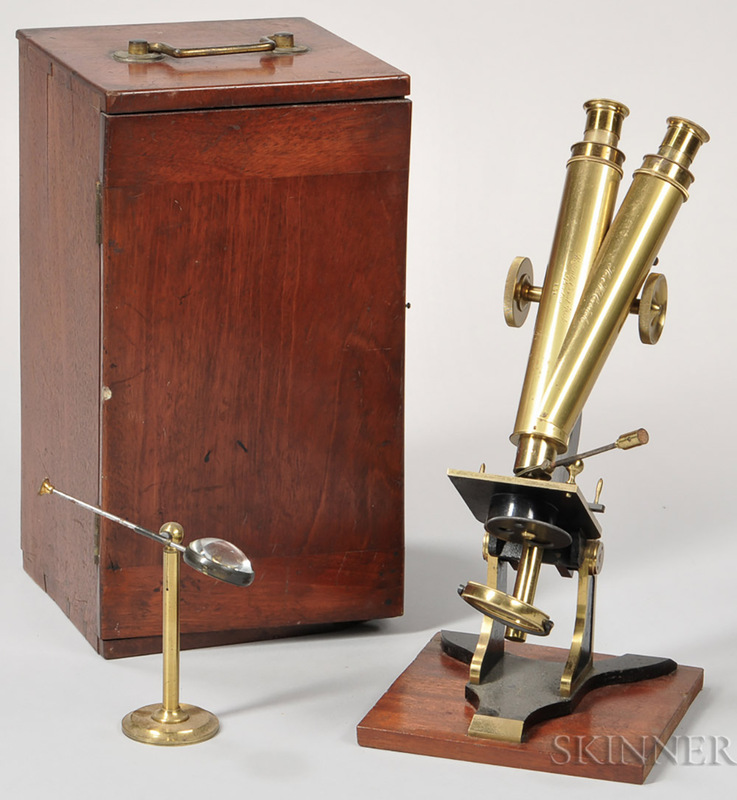 1894-1900 microscope distributed by S. Maw, Son & Thompson that is shown below in Figure 23. The signed Crouch Student microscope stands about 9.5 inches / 24 cm, and the other is 12 inches / 30 cm tall. Figure 18. 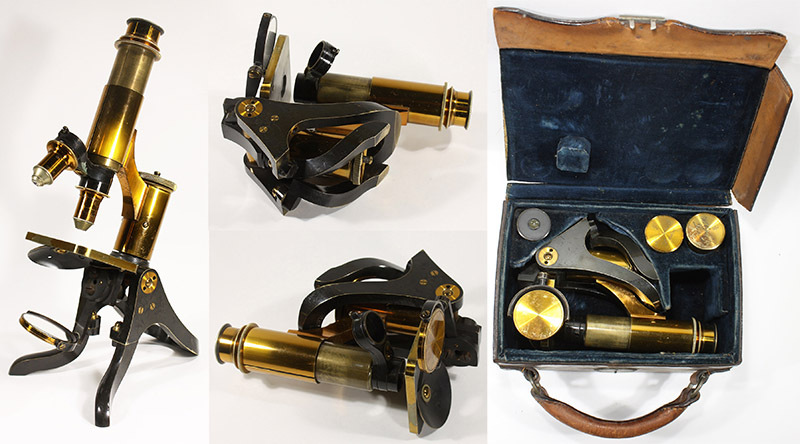 To judge from the large number of surviving instruments, these were very popular microscopes. 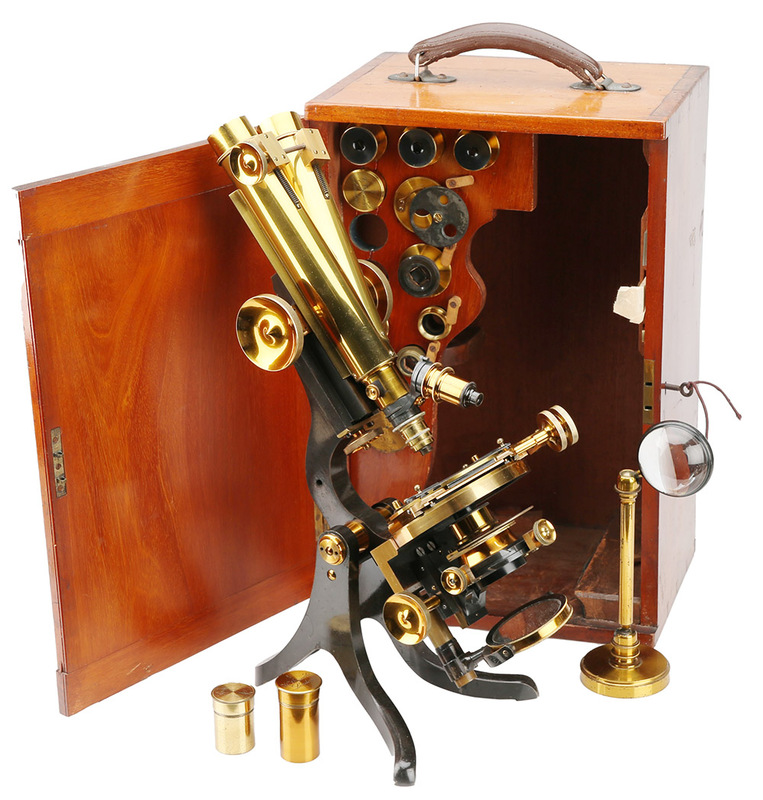 The draw-focus version appears to have been produced first, with serial number 3025 being the oldest known microscope, and serial number 9514 the newest. The oldest identified microscope with the rack-and-pinion focus is number 5938, and this design was used through at least number 10142. Microscopes with limbs such as those shown in Figures 14, 15, and 22 continued to be manufactured alongside these models. Figure 19. A Number 1 Crouch microscope, circa late 1880s. Serial number 6500. 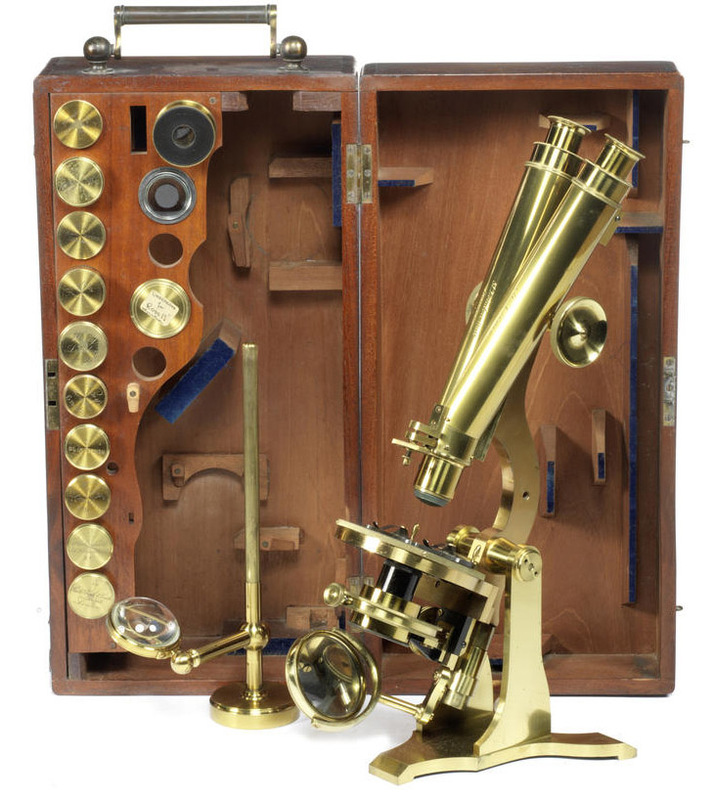 Adapted from https://collection.sciencemuseum.org.uk/objects/co8454/large-compound-microscope-by-henry-crouch-with-box-and-accessories-compound-microscope. Figure 20. A rare folding microscope by Crouch. It has serial number 7612, and was produced ca. 1890. Based on the popular model illustrated in Figure 18, to foot is modified to swivel the front of the legs, and fold the foot backwards over the stem. The mirror support is also modified, allowing it to swing flush with the stage. The folded microscope packs into a compact leather case. Figure 21. Crouch was producing cameras and photographic lenses by 1886. It was also during this year that advertisements first listed the business as being a Limited Corporation. Left advertisement from “Photographic News”, right advertisement from “Hardwicke’s Science-Gossip”. Figure 22. Circa 1886 Henry Crouch camera. Figure 23. 1890 advertisement, from “Knowledge”. Figure 24. 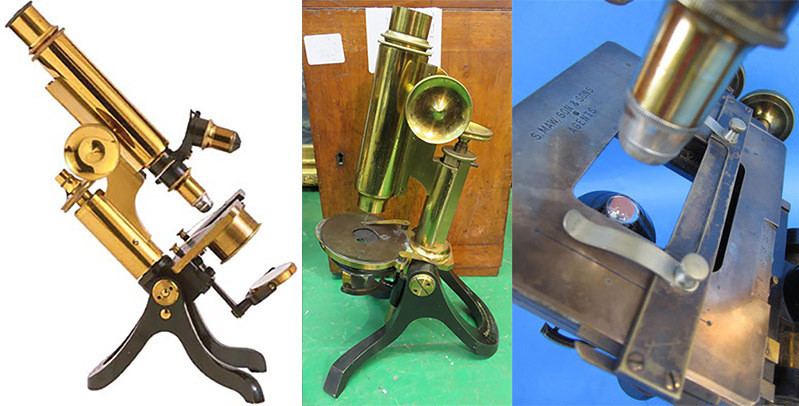 Three microscopes that were retailed by S. Maw, Son and Thompson / S. Maw, Son and Sons. Left, signed “Crouch” on the foot, serial number 9108, and on the stage, “S. Maw, Son & Thompson, Agents”, dating it between 1894 and 1900. Center, signed on the foot “S Maw, Son & Thompson, London”. Crouch’s name does not appear, and there is no serial number. Maw, Son & Thompson’s name dates it to 1894-1900. Presumably, it was made specifically for them by Crouch. Note that the foot shape resembles that of the Educational model shown the right side of Figure 17, above. Right, the stage of serial number 9656, signed on the stage, “S. Maw, Son & Sons, Agents”, dating it to between 1900 and 1907. The image on the left was adapted for educational, nonprofit purposes from http://www.arsmachina.com/crouch9108.htm. Figure 25. Serial number 9657, a folding microscope, signed by Crouch. The stage is engraved with notice that the microscope was distributed by S. Maw, Son and Sons, dating it to between 1900 and 1907. Figure 26. 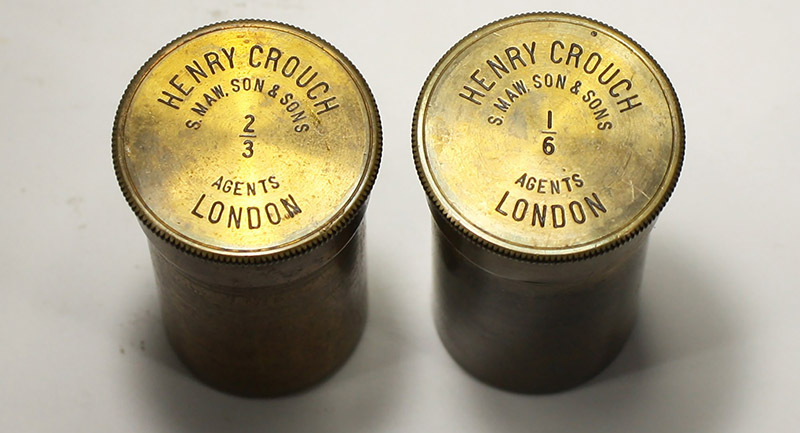  Two objective lens canisters, signed by Henry Crouch, with S. Maw, Son and Sons as agents. They were produced between 1900 and 1907. Figure 27. A 1908 advertisement from S. Maw, Son & Sons, for equipment manufactured under the supervision of Henry Crouch. Figure 28. 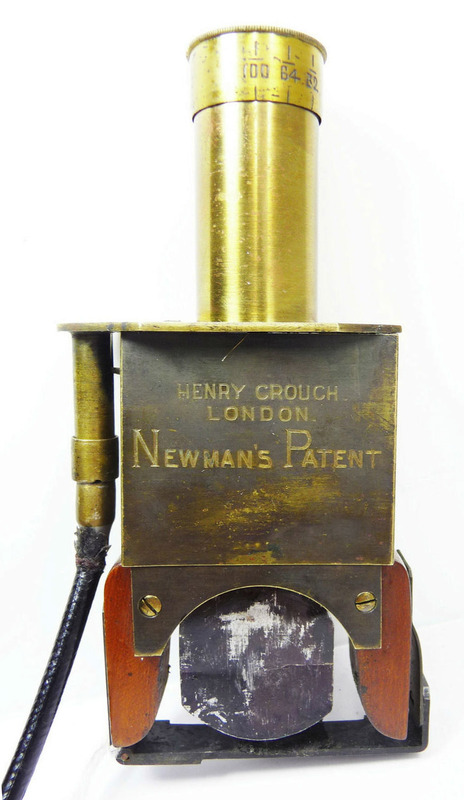 A Crouch microscope with a "continental" type of foot, stamped with serial number 10191 and "Henry Crouch branch of S. Maw Son & Sons". In contrast, the microscope with serial number 10142 has a Crouch foot and is marked simply "Henry Crouch". Those markings suggest that number 10191 was manufactured ca. 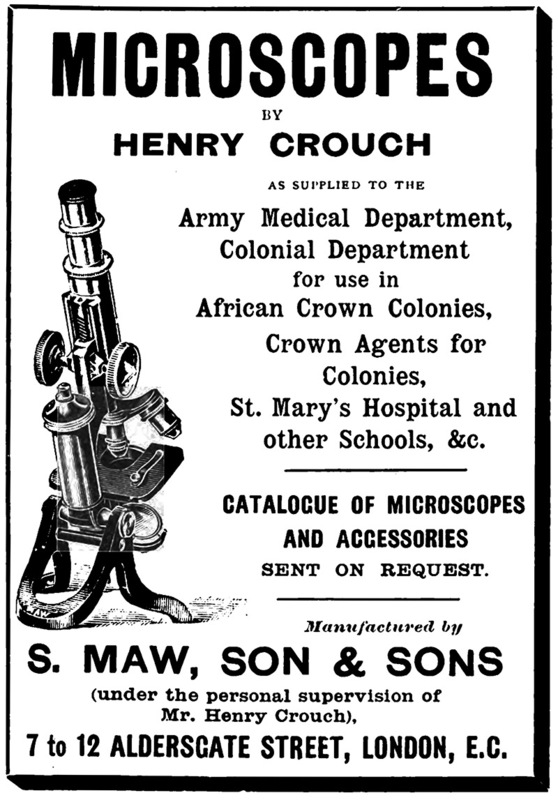 1907, when S. Maw Son & Sons purchased Crouch’s business, and that, prior to the sale, Crouch distributed microscopes both through his own shop and through S. Maw Son & Sons. Images adapted for nonprofit, educational purposes from an internet auction site. Figure 29. A different model of Crouch microscope with a "continental" foot, stamped with serial number 19203 and "Henry Crouch". 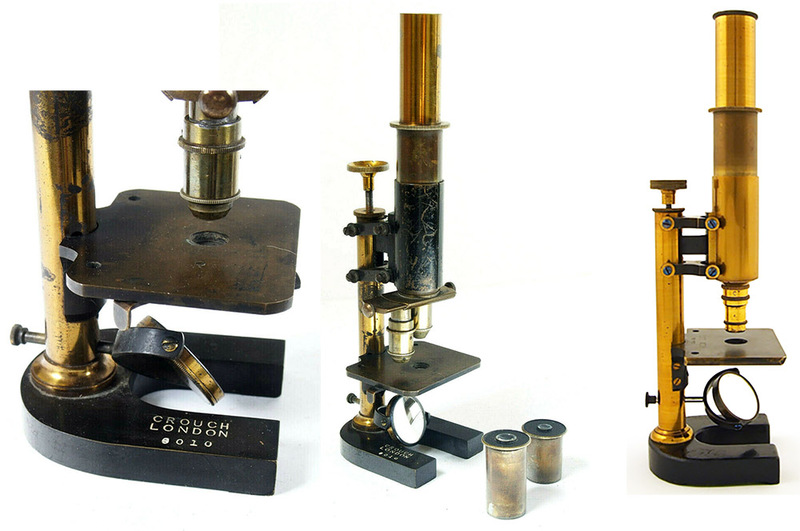 Comparisons with other microscopes with lower serial numbers (see above) suggest that this instrument was manufactured after 1910. It is not known whether S. Maw Son & Sons sold microscopes with only Crouch’s name on them, or Crouch independently produced this microsocpe. Images courtesy of David Harries. Thank you to Cameron Day for providing biographical information. 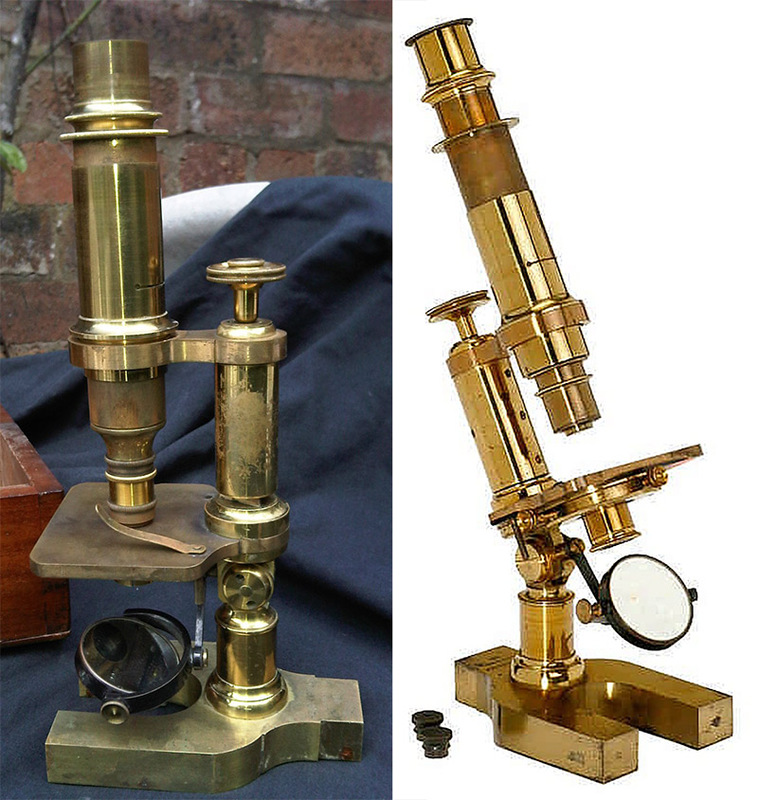 Many thanks to Allan Wissner for generous permission to use images from his web site, http://www.antique-microscopes.com, and to David Harries for pictures of Crouch microscope 19203. All other images are adapted for nonprofit, educational purposes from internet auction and retail sites.